Excess nutrients can have a devastating impact on the marine environment. The problem is called nutrient pollution, and two of the main culprits are phosphorous and nitrogen, which come from sources such as agricultural run-off and household waste. Challenging because when too much phosphorus and nitrogen flow into waterways, they cause algae to flourish and create huge algal blooms so large they can be seen from space. As the algae dies and decays it consumes dissolved oxygen in the water, which can then kill other plants and animals that need oxygen for survival. Chicago’s wastewater contributes to nutrient pollution. It ultimately flows south to the Gulf of Mexico, where the excess nutrients help trigger algal blooms that have created a dead zone covering up to 7,000 square miles. But a new nutrient recovery process developed by a Vancouver-based company called Ostara that is being used by the Metropolitan Water Reclamation District may help change that. In the video below, Ostara’s Chief Technology Officer Ahren Britton explains how the nutrient recovery process at the MWRD’s new treatment facility in Stickney extracts premium-grade fertilizer from wastewater. Joining Abrary in Chicago to officially open the facility is Robert F. Kennedy Jr., who serves on the board at Ostara. The process also required a lot of chemicals, Kennedy said. But there’s another reason the new technology is so beneficial, and it’s tied to the value of phosphorus itself. But there are not unlimited supplies of the element in the natural world. 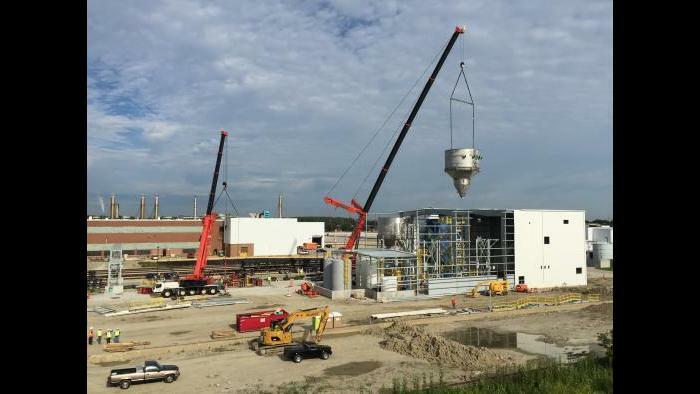 Video: Timelapse video shows a reactor being lifted, rotated and placed into what is now the world’s largest phosphorus recovery facility at the Stickney Water Reclamation Plant.